Why Do Metal Waste and Recycling Receptacles Outperform Plastic Receptacles? No Comments on Why Do Metal Waste and Recycling Receptacles Outperform Plastic Receptacles? When we purchase any product, such as a waste receptacle, there are many costs and benefits to consider in addition to price. While a cheaper price may be an advantage in the short run, it may come with hidden costs to you, your building guests and even your profits. A cheaper plastic receptacle might actually cost you more in the long run. Looking at a product’s price in relation to other key attributes will tell a clearer story about the value your facility is getting when it chooses its waste and recycling receptacles. If issues such as long term costs/replacement costs, public safety and environmental impact, are important to you, this comparison of plastic vs. metal waste receptacles below will be helpful to you. Imported plastic waste receptacles are often less expensive than metal waste receptacles, however if they come from other countries, find out what you are really paying for. Often imported, a good proportion of your cost of a plastic receptacle is going towards the shipping, packing and transportation costs rather than the quality of the product and its materials. By contrast, a locally manufactured metal waste receptacle made in the USA will include fewer non-product costs that drive up a product’s price but do not improve a product’s quality level. Domestically manufactured products take less energy to ship and pack, so the price you pay is for the product itself. If quality and value are important to you, it’s essential to understand these differences. Because plastic waste receptacles are not built as robustly as metal cans, they often need to be replaced many times leading to a higher replacement cost. Over the lifetime of a heavy duty steel/aluminum metal trash can that might last upwards of 25 years or more, a plastic receptacle could need replacement 3 times or more. The lifetime cost of trash disposal at that particular location is therefore much higher with a cheaper alternative that does not perform as well as a built-to-last metal waste receptacle. In the end, plastic can cost you more and be taxing on your operations budget for these reasons. From a safety standpoint, plastic receptacles are not fire safe. They are known to be flammable, meltable and toxic. Glaro Inc. does not endorse the use of plastic for all purpose receptacles. “Plastic receptacles are not known for their safety and have virtually no effect on containing a fire. Metal receptacles, such as those manufactured by Glaro Inc. do not melt and they do not burn. In fact, heavy duty metal receptacles are safer because they can help contain fires (and in come cases extinguish them) by restricting the flow of oxygen which is critical to a fire’s ability to start and spread,” says Executive Bob Betensky. Waste receptacle units with an additional steel inner liner can create optimal fire resistance and are superior fire-safe receptacles available on the market. Plastic waste receptacles have been found to also emit toxic fumes (when exposed to fire) harmful to the safety of others as well as the environment. They are not Green products. They can be recyclable however due to their inexpensive nature they are normally discarded and require several replacements over time, driving up the use of energy and production as well as ultimate cost of the product over time. The vast majority never get recycled. All metal waste and recycling receptacles are recyclable; they can be made from recycled metals; and they do not emit harmful toxins. They also last a long time and require fewer replacement products, which saves energy and money. In summary, while plastic waste receptacles may be the right choice for some, price alone is not always a telling indicator of quality or value. 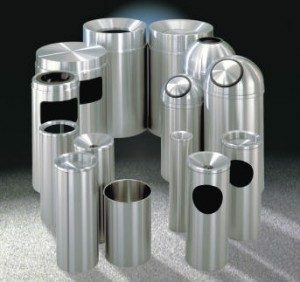 When long terms costs, quality, public safety, fire safety and environmental impact are taken into consideration, a metal waste receptacles has many advantages. For more information, visit https://glaro.com/waste-receptacles/.